I'm rarely down in the area of Costa Mesa/Newport Beach just because I live out in Garden Grove BUT there are really some amazing gems popping up in that area at the end of the 55! 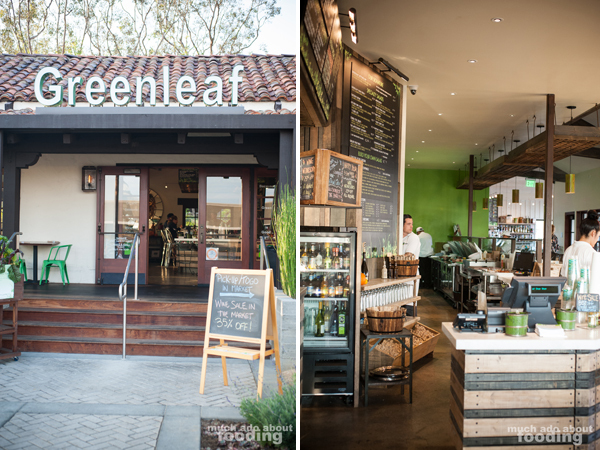 One of them is Greenleaf Gourmet Chopshop which actually is not the only of its kind but started out in Los Angeles (they have Beverly Hills and Century City locations). I was invited to check out their Happy Hour menu which is featured from 3-5pm every day. Specials for their Happy Hour include $4 glasses of wine at their fun wine wine, $4 glasses of tap beers, $5 rotating specialty Soju cocktail, $5 thin-crust "pizzas" (the crust is actually a tortilla! 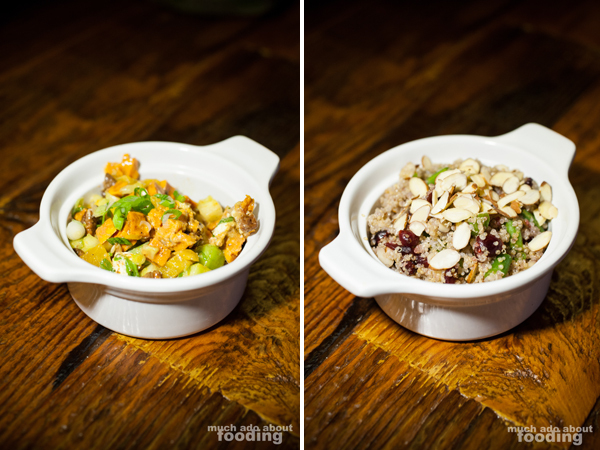 ), and 50% off all side dishes and their newest Small Plates selection. Those are some really neat specials and the venue was a just an overall neat place! 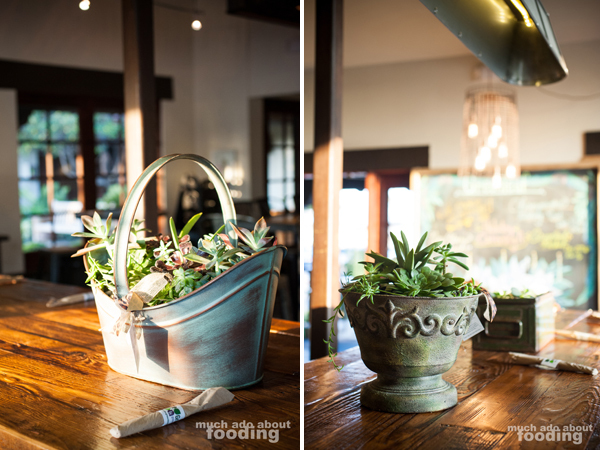 This Costa Mesa location has a old garden feel to it which they complemented with their ample spreading of succulents in antique-looking vases or containers. The windows are expansive, letting in a lot of natural light and letting you look out at the actual greens they are growing around the building. There is an outdoor back area with wooden benches and an earthy garden which can actually be rented out for private parties. 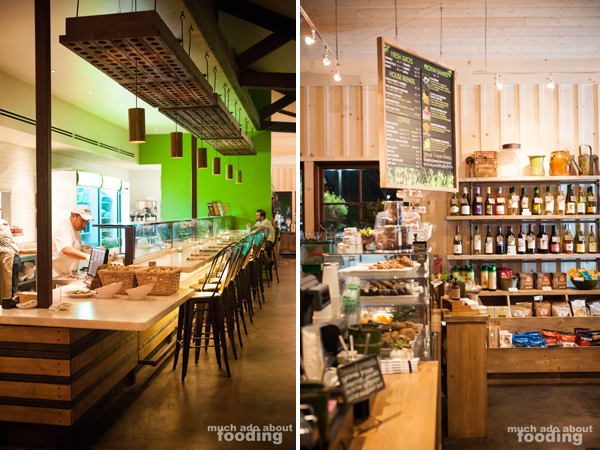 The large wooden tables combined with the natural lighting gives you a sense that you are actually seated outside. In addition to regular seating and the large picnic-style table in the center, there is also bar seating and an outdoor patio. If you go beyond the bar, you'll also see their little shop where you can get drinks and locally-made small pantry items. They've even started carrying some fresh fruit and baked goods! If you're interested in getting some food to go, you're able to call in your order and pick it up through this shop as well. I guess we can finally talk about the food though right? We started off with their Happy Hour soju cocktail special which was their housemade apple cider soju cocktail. As Devon (PR rep) so aptly put it, the drink was like an adult apple juice! The presentation was appealing in its open jar and two thin slices of Granny Smith apple as garnish. The drink was refreshing and a bit nostalgic because hey, it really was like apple juice with a smidgeon of alcohol! 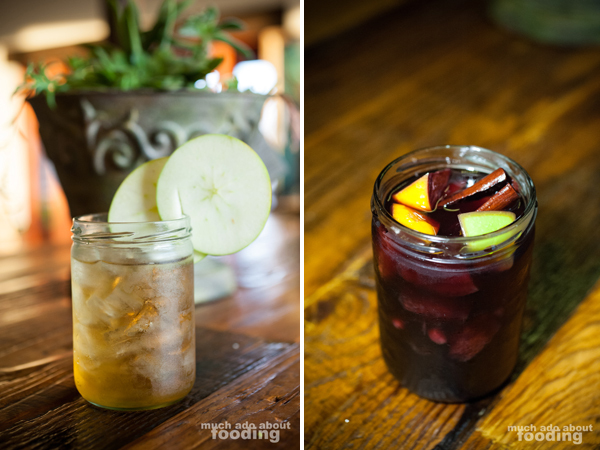 We also had their sangria, a stellar drink; I've normally had sangria that was too watered down and Duc has had ones that were too strong in alcohol content but this one was just right. Full of fruits and accented by some large cinnamon sticks for holiday cheers, this drink is a definite must. So the Small Plates menu selection is to encourage sharing, and I love how a lot of restaurants have found their way into this type of plating recently. Eating is such a communal thing! 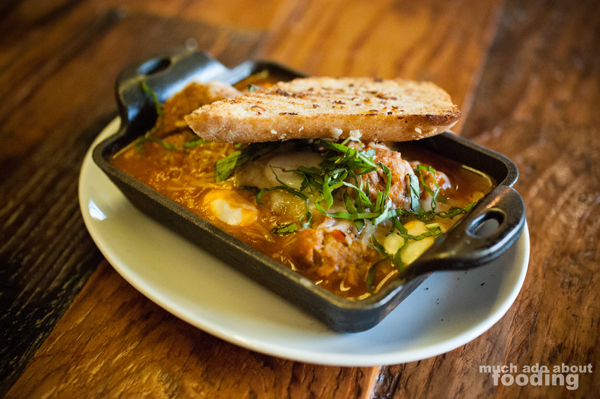 Then again, when you make Small Plates this good, how could anyone agree to share? We started off with the Salmon Crudo, Steak Sliders, and Turkey Sliders. 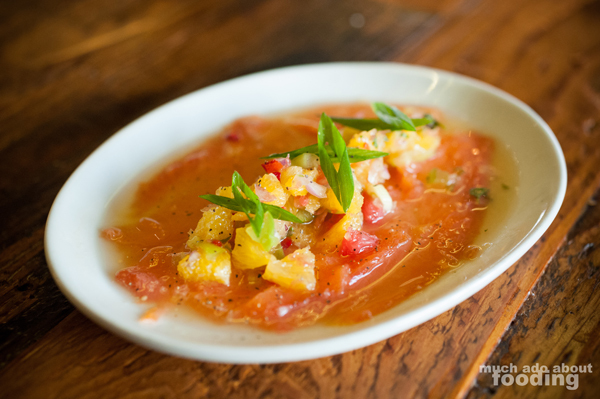 The Salmon Crudo was artfully presented with small morsels of clementines, grapefruit, and pineapple; what a bright dish. The sliced green onion garnish contributed to the freshness of this dish which would be a perfect summery snack. 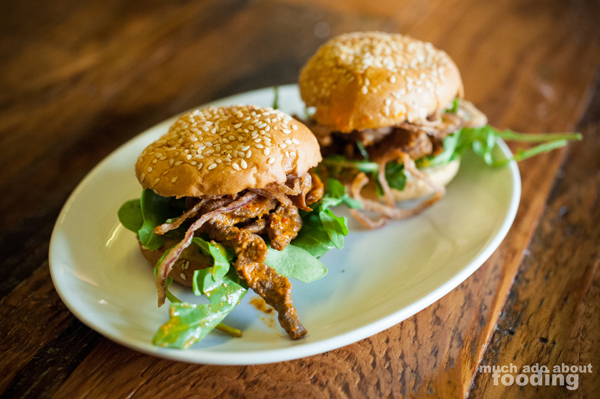 The Steak Sliders were one of my favorites with its crisp and tangy sauce. 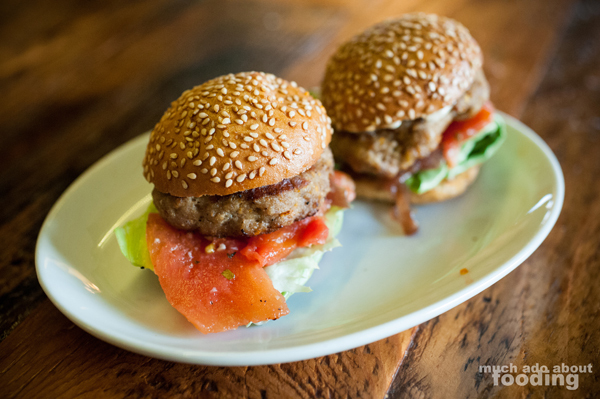 The Turkey Sliders had amazing turkey patties that were soft in texture and yet remarkably hearty in flavor. I highly recommend these. A favorite not only amongst us but also with customers in general from what they told us were the Turkey Meatballs which were brought out to us in a cute small baking dish swimming in a savory marinara sauce alongside melted mounds of cheese. The fresh basil on top paired with some crusty bread was just perfect to go along with this Italian dish. The rotating Small Plate they have on their menu is aptly called "Grilled Deliciousness;" for us this day, it was a plate of roasted pears, prosciutto, and burrata atop greens drizzled with a balsamic reduction. Does it taste as lovely as it reads? Better. The sweetness of the pears combined with the saltiness from the prosciutto in just the right way while upon a pillowly pile of fresh burrata and crunchy greens. Oh so delicious. Then there was their most popular "pizza" - the Wild Mushroom and Truffle. 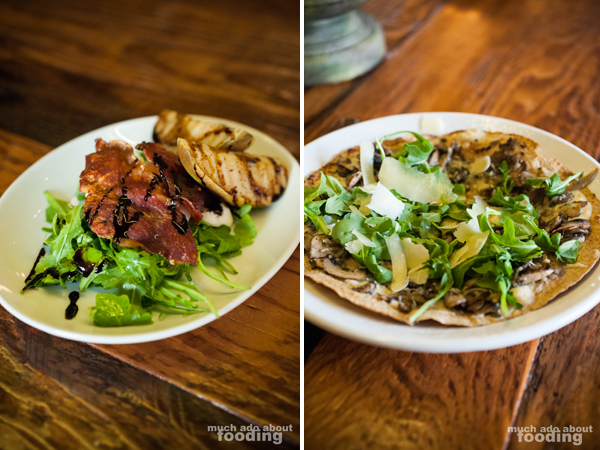 The crust is a wheat tortilla and the toppings were all sorts of mushroom with greens and freshly shaved Mozzarella. Speaking of mushrooms, there is also the seasonal bruschetta which was mushroom-based this time. Bring it on, I say! I love mushrooms so, so much. There was an explosion of mushrooms on top of the bread for this one as every common variety was piled on top with sundried tomatoes and basil. 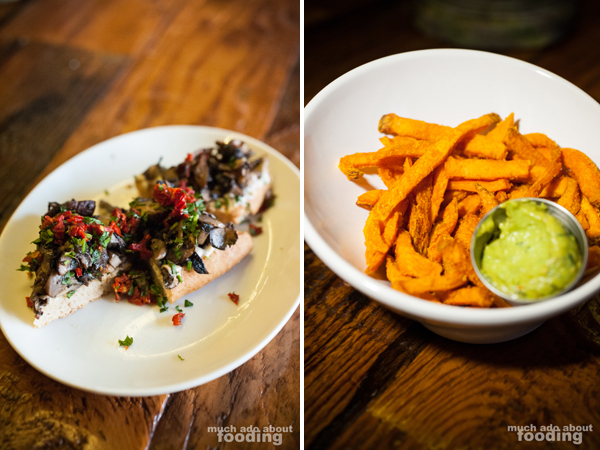 We also decided to try some of their sides including some very excellent sweet potato fries that came with an avocado pesto dipping sauce; you wouldn't think that this would be the sauce you'd fall in love with but give it a try. The fries were crisp and sweet but what really brought out the refreshing nature of having more vegetables and healthy food like Greenleaf's in your diet was the pop from the pesto. Fabulous stuff. We also snagged their Beets, Yams, Walnuts, and Goat Cheese Salad (tangy, cold, and full of flavor) and the Quinoa Salad (like a Thanksgiving salad filled with slivered almonds and dried cranberries!) to finish off our meal. So while it's a great place to meet with people to catch up or just for fun during the daytime because of all the window lighting, it becomes a slightly romantic place when the sun goes down and the candles come out. 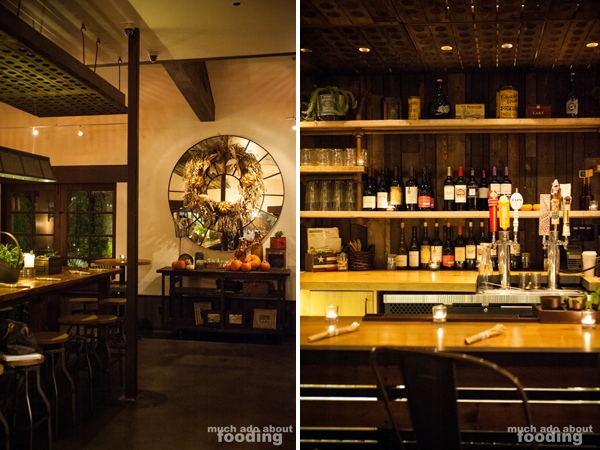 Wooden French riddling racks above you and dark wood all around, Greenleaf gives off a nice nighttime garden feel too. It's definitely a versatile place that you'd love to just relax at; just a bonus, there is free wireless! I wish I lived in the area so I could come by any time just to eat healthy and feel more alive in this setting. By the way, I've also heard that there is a killer brunch! If you decide to go, take me along please. It was great - my thanks to Devon and Max for having us!